The Shadow, a crime drama, debuted in 1930 and instantly became a national sensation. 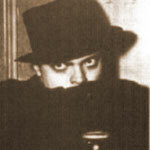 Broadcast from 1930 to 1954, The Shadow's tremendous popularity lasted for more than two decades. Sponsored by Blue Coal, the series was created by Walter Gibson, who made Lamont Cranston, known as the Shadow, the most famous crime fighter. Gibson's creation ushered in an era of pulp magazine superheroes, such as The Green Lama and Batman. The Shadow Magazine was first released in 1931 and Gibson would continue to write for a total of more than 280 issues. Among the many actors, Orson Wells, Bill Johnstone, and Bret Morrison were perhaps the most liked voices for the Shadow. Agnes Moorehead starred as Margo Lane, Cranston's sidekick and romantic companion. At its peak, the show boasted 15 million audience a week. Today, The Shadow is considered the synonym for old time radio. Each show opens with an eerie, spine-chilling announcement, "Who knows . . . what evil . . . lurks . . . in the hearts of men? . . . The Shadow knows!" When justice is restored, the Shadow wraps up his case in a memorable closing, " The weed of crime bears bitter fruit . . . crime does not pay! . . . The Shadow knows!"